Here's the latest article by Sydney lawyer and international affairs analyst David Singer. It's entitled "Palestine: 1922 Two-State Solution Key To Resolving Arab-Jewish Conflict". United Nations Secretary-General Ban-Ki Moon has jetted into Jerusalem on a fool’s errand – with tensions continuing to escalate between Arabs and Jews as their conflict spanning almost 100 years remains unresolved. Safeguarding this “two-state solution” – code words for creating a second Arab State in Mandatory Palestine in addition to Jordan – is a lost cause. Restoring talks on this failed political process after twenty years of fruitless negotiations is meaningless United Nations babble speak. 2. the political machinations of France and Great Britain between 1920 and 1922. The riots were intended to pressure decisions affecting the fate of Palestine, Lebanon, Syria and Mesopotamia (Iraq) at the San Remo Conference starting on 19 April 1920 following the liberation of those territories from 400 years of Ottoman Empire rule in World War One. The Arabs opposed a Jewish homeland in Palestine – and went on a murderous rampage to express their rage. Five Jews and four Arabs were killed and hundreds wounded between 4 April and 7 April 1920. However the riots had little impact on the decisions taken at San Remo and the subsequent signing of the Treaty of Sevres. 2. Empowered Great Britain as the Mandatory Power to be responsible for placing the country under such political, administrative and economic conditions as would secure the establishment of the Jewish national home whilst safeguarding the civil and religious rights of existing non-Jewish communities in Palestine and the rights and political status enjoyed by Jews in any other country. 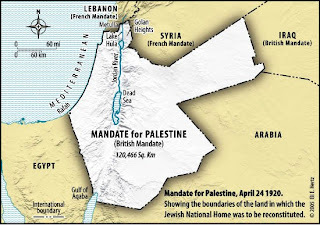 The Mandate however contained Article 25 – a provision used to deny the Jews the right to reconstitute the Jewish National Home in Transjordan – 78 per cent of the territory of Mandatory Palestine. The inclusion of Article 25 followed French pressure on the British to stop Abdullah – the second son of the Sharif and Emir of Mecca Hussein bin Ali – leaving Transjordan whilst en route to Damascus with an armed force of 400 Arabs to help his brother Feisal resist French attempts to remove him from power in Syria. Britain obliged by appointing Abdullah Emir of Transjordan on 11 April 1921. This Emirate became the independent Jew-free Hashemite Kingdom of Transjordan in 1946 – today’s Jordan. Achieving these British and French objectives closed the door firmly on any right to reconstitute the Jewish National Home in Transjordan – confining that right within the remaining 22 per cent of Mandatory Palestine – today’s Israel, the West Bank (Judea and Samaria) and Gaza. 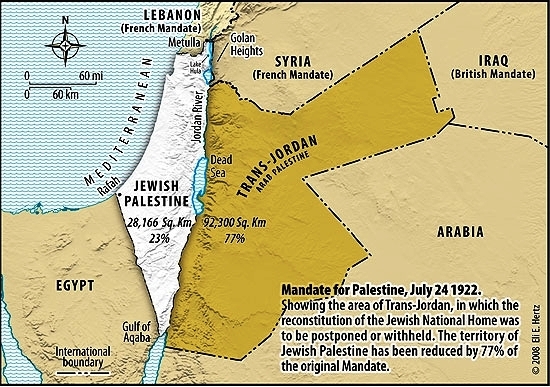 Redrawing the current boundaries of that fateful 1922 decision -– taking into consideration today’s changed circumstances on the ground -– remains the key to ending the Arab-Jewish conflict. Pencils and rubbers wielded by Israeli and Jordanian negotiators can end the indiscriminate murder and maiming of Jews by Arab gun-toters, knife-stabbers, stone-throwers and car-rammers -– and the inevitable Jewish response. The Arabs already weighed in on this. No two states no Israel no Jews. Which parts of the last hundred years are we pretending didn't happen? Like it or not the groundwork for the two-state solution was laid in 1922 when the Mandate resticted Jews reconstituting the Jewish National Home in 78% of the territory of the Mandate. That decision resulted in two states - Jordan in 1946 and Israel in 1948 being established on 95% of the Mandate territory. 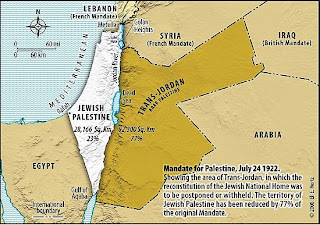 What has proved an abject failure have been attempts to create a second Arab State - in addition to Jordan - in the territory covered by the Mandate. Could you imagine the international uproar if anyone suggested a second Jewish State be created in the same area? Ban-Ki moon and the totally discredited United Nations would have a collective heart attack.